There’s a strong-willed woman with a vast reputation who so affected culture that much of her work casts a shadow that reaches well into today. She had a cult following that numbers many who influence the world of today. It’s not Ayn Rand I speak of, but Diana Vreeland. Both Rand and Vreeland could be intimidating and had a similarly unconventional, highly stylized appearance and persona, but there’s a lot of difference between them. Ayn Rand wrote florid romances with enough talent to attract generations of readers, but chose to gather all the attention into a divisive philosophy that she wanted people to take very seriously indeed. Vreeland, as editor at Harper’s Bazaar in the 1950s and Vogue in the 1960s, took the fashion magazine and developed it into a multifaceted cultural touchstone that married imagination, style and intelligence into a roadmap for the celebration of freedom – in particular, freedom for women. One could easily deride the world of fashion as a frivolous pursuit, and scoff at any contribution of someone who took it seriously, but Vreeland is the perfect figure to regard if you want to argue that style matters. Diana Vreeland: The Eye Has To Travel, a recent documentary focusing on Vreeland and her work, is now available on DVD and download. It’s a smart and candid look at a woman who discovered how to share her sensibility with the world. Featuring parts of Vreeland’s dictation of her memoirs to writer George Plimpton, and interviews with former employees and collaborators, it’s a celebration of a time when style had a direct and powerful relationship with changing the world. To her, style was a way to make your imagination apparent. Perhaps this enthusiastic maverick was more than anything a product of her times: from her Belle Epoque childhood watching Nijinsky leap across the stage, through her period of liberating flapperhood, and into the postwar era when she commanded the pages of glossy magazines, she was always ready for the new and exciting. During the period when Vreeland wielded power and influence she embraced the new opportunities for women and led by example. She adored being a powerful female who had “things to do,” work was something that she indulged in, something that surely proved useful for a creature with such vast energy. And her work was far from a private affair. It involved staff and assistants as well as photographers (such as Richard Avedon and David Bailey) and stylists who helped her expand the scope of their endeavor. Viewing the results (prominently and cleverly featured throughout the film) it’s easy to see how it helped make the magazine an important artifact of a world embracing change and progress. Magazines of today lumber towards irrelevance under the weight of consumerist/corporate ad-heavy fluff. Unlike them, the Vogue of the 1960s took its cue from Vreeland’s sensibility – she chose models in a novel way, breaking from the clothes-horse with ideal proportions, and developed enthralling ways to depict fashion. By veering the world of fashion away from the well-heeled lady to the world of the young, to other faces and races and places and attitudes, she celebrated freedom and the people who used it to “invent themselves”. 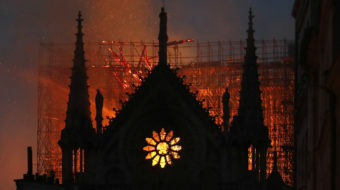 As one witness suggests, she seemed to have been waiting for the ’60s. Vreeland also saw clothes as clues. She enthused that if you observe carefully you can see the “oncoming revolutions” in them. She was talking about clothes as something people create and wear for personal reasons, making them important in several ways, rather than as mere products. Vreeland helped Vogue attain renown and success, but often she was at odds with selling ads and making advertisers comfortable. 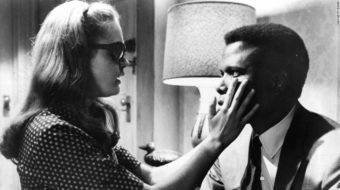 One can see in the film the trajectory that would end in conflict, eventually resulting in her dismissal as the 1970s unfolded. For Vreeland, it didn’t seem to be about buying but inventing: Enthusing about Japan she celebrated that the island didn’t deliver gold or diamonds, that the Japanese had to work at developing style from very little, and perhaps that’s why they had such success at it. 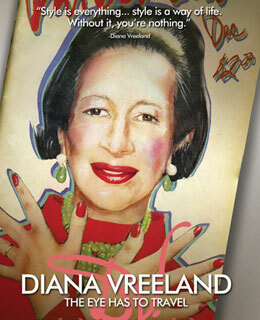 To Diana Vreeland work was never a burden, but always an opportunity. The Eye Has To Travel does its subject justice in making apparent the vitality and enthusiasm that guided this remarkable women. It also reminds the viewer of the power of modernist thought and how it could recircuit the way we see the world and ourselves, delivering change and forward movement, sometimes with incredible flair. 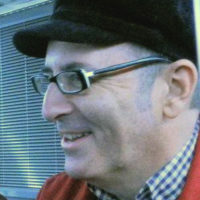 Frederick Barr has been involved in communications for over 25 years, first as a creative professional in advertising and design, and more recently as an information activist.